It certainly looked that way as the visitors conceded 19 points in the first 15 minutes before they had even ventured into their opponents half. But Melton’s resilience has grown this season, highlighted by strong displays at the breakdown from Stuart Kempin, Jack Forfar and the outstanding Duncan Lennox. This energised Melton and they had several close calls deep into Oundle territory. Yet each time a stray pass or a marginal decision went against the visitors, allowing Oundle to counter-attack and score two further tries out wide. Dave Meakin replaced the injured Kempin and immediately carried the ball with force, battering his way to the try line. Lack of support at the vital moment again led to Oundle clearing their lines and scoring against the run of play, right on the stroke of half-time. The hosts led 38-0 at the interval, yet Melton were down but not out. The second half was played at breakneck speed with Melton giving as good as they got all over the field, with some excellent contributions from the younger members of the squad. Harry Eley, at loose head prop, had a great contest throughout and coped with all the changes Oundle could throw at him. Jake Dixon carried and tackled throughout the match like a veteran, while Aiden Smith and Will Garnett were superb in defence and made ground with little service, time or space. Melton attacked the home line and were unlucky to be held up three times. Wayne Greaves came on for the warhorse Meakin and added his experience to the breakdown, but despite more prolonged pressure, the hosts scored two tries which again began in their own 22 after turning over Melton ball. But back came the visitors through Chris Rose, restored to outside-half. 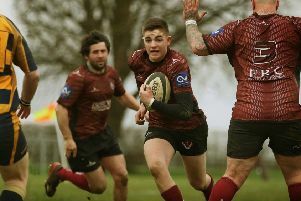 Chances came and were denied, firstly to Gareth Collins, and then Leon Gormley, but it was Melton’s captain fantastic Gormley who was rewarded with a richly deserved try, intercepting a pass to score under the posts from which Harvey Green converted. It was only seven points, but thoroughly deserved for all of the team’s hard work and desire to play rugby at the highest level. It was another testament to the progress this young squad have made in Midlands One under the leadership of Gareth Collins, Leon Gormley and Duncan Lennox. They face another stern test on Saturday when Melton host second-placed Paviors (kick-off 3pm) at Burton Road. * Melton RFC celebrated good news off the pitch on Sunday when club officers received official accreditation from the RFU. Accreditation is awarded to well-run grassroots clubs with all the correct procedures in place, particular in regards to safeguarding, and in turn allows clubs to access RFU funding. * Melton have been handed a trip to Midlands One rivals Oadby Wyggs in the County Cup semi-finals, with date to be confirmed.